We recently read that drivers are exposed to more pollution than people on bikes or pedestrians due to the closeness of cars air intake to the exhaust emission of the vehicle in front and the limited exchange of air within cars. We’ll show you the evidence and suggest 2 solutions. It has frequently been claimed that cycling in heavy traffic is unhealthy, more so than driving a car. To test this hypothesis, teams of two cyclists and two car drivers in two cars were equipped with personal air samplers while driving for 4 h on 2 different days in the morning traffic of Copenhagen. The air sample charcoal tubes were analysed for their benzene, toluene, ethylbenzene and xylene (BTEX) content and the air filters for particles (total dust). The concentrations of particles and BTEX in the cabin of the cars were 2-4 times greater than in the cyclists’ breathing zone, the greatest difference being for BTEX. Therefore, even after taking the increased respiration rate of cyclists into consideration, car drivers seem to be more exposed to airborne pollution than cyclists. Some people may conclude that driving less (and cycling/walking more) is a solution to this problem. We beg to differ we have 2 suggestion to equalise the the exposure to pollution between drivers and cyclists. It’s not bicyclists who should be expected to enjoy the freedom from pollution with a cycling mask. We drivers should wear one to keep the fumes at bay. 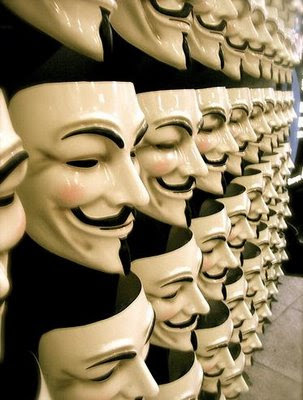 What mask will you wear on when you drive to work on 11/12? This entry was posted in Uncategorized on November 24, 2012 by David. This is terrible. I’m shocked to discover that these “pollutants” our cars produce* are not an unfortunate externality inflicted only on commuters with little value (not just my opinion; it’s the government’s opinion too), but something that can affect motorists as well. Luckily it appears that this research is a little out of date. The cars used in the test were a 90s VW Vento and Fiat Brava, neither of which would have been fitted with the air filters often found in more modern cars. But Wikipedia says that even new cars don’t have proper HEPA filters as part of their ventilation systems. We should campaign for this so that pollutants can be kept out of our cabins and put back in the mouths of pedestrians and cyclists – where they belong. * And I’m yet to be convinced by this so-called “evidence” that they are actually harmful; after all, how could something as good and beneficial as the internal combustion engine produce something that’s as bad as these “scientists” claim? It’s all rubbish. Far from causing pollution, motor cars actually cleanse the air as they drive along. With their sophisticated air filters and catalytic converters, the air that comes out of the back of a motor car is much cleaner than the muck that goes in at the front. Bad air is caused by vegetarian cyclists who eat too many beans farting a lot and by the immense amount of coal that needs to be burnt to keep electric trains running – everyone knows that!